There’s nothing to downloading — on your Galaxy Tab or anywhere else — other than understanding that most people use the term without knowing exactly what it means. Officially, a download is a transfer of information over a network from another source to your gizmo. For your Galaxy Tab, that network is the Internet, and the other source is a web page. 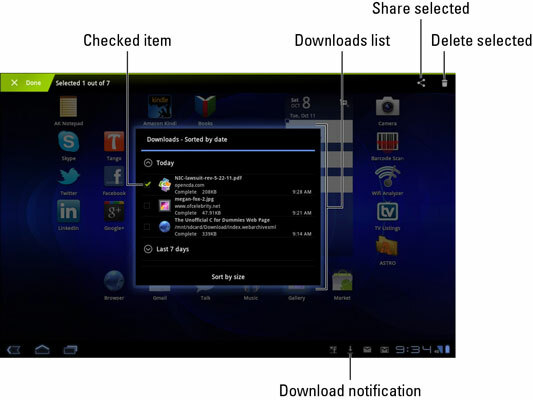 The Downloading complete notification appears after the Galaxy Tab has downloaded something. You can choose that notification to view the download. There’s no need to download program files to the Galaxy Tab. If you want new software, you can obtain it from the Android Market. Most people use the term download to refer to copying or transferring a file or other information. That’s technically inaccurate, but the description passes for social discussion. The opposite of downloading is uploading. That’s the process of sending information from your gizmo to another location on a network. The simplest thing to download is an image from a web page. It’s cinchy: Long-press the image. You see a pop-up menu appear, from which you choose the command Save Image. To view images you download from the web, you use the Gallery app. Downloaded images are saved in the Download album. Technically, the image is stored on the Tab’s internal storage. It can be found in the download folder. The web is full of links that don’t open in a web browser window. For example, some links automatically download, such as links to PDF files or Microsoft Word documents or other types of files that can’t be displayed by a web browser. Such links are automatically downloaded. To save other types of links that aren’t automatically downloaded, long-press the link and choose the command Save Link from the menu that appears. If the Save Link command doesn’t appear, the Galaxy Tab is unable to save the file, either because the file is of an unrecognized type or because there could be a security issue. You can view the saved file by using the Downloads app. The Quickoffice app is used on the Galaxy Tab to display PDF and Microsoft Office files. The Browser app keeps a list of all the stuff you download from the web. To review your download history, open the Downloads app on the Apps Menu screen. You’ll see the list of downloads sorted by date. To view a download, choose it from the list. The Galaxy Tab opens the appropriate app to view the download. The Download Manager also lists any web pages you’ve downloaded. To remove an item from the Downloads list, place a green check mark in its box. Touch the Trash icon at the top of the screen to remove that download. Sharing a downloaded item is done by placing a green check mark by the downloaded file and choosing the Share icon button at the top of the screen. You can quickly review any download by choosing the Download notification.